Apply tea bags (preferably chamomile) dipped in lemon juice for 10 minutes. Apply a paste of turmeric powder with pineapple juice for 10 minutes. Apply crushed mint paste under the eyes for 20 minutes. Apply cotton balls dipped in rose water under eyes for 10 minutes. Apply potato or cucumber slices on eyes for 10 minutes. Yes they contain enzymes that lighten the skin. Massage under the eyes with Almond Oil before bed. Use moisturizers with Vitamin K, Vitamin E and Retinol. Acupressure: Using your index finger, press very firmly against the bone just beneath your eyes and hold the pressure there for 3 seconds. You should repeat this process 10 times each morning to get rid of dark circles. Get plenty of sleep nightly. Before going to bed at night, remove all eye makeup. Drink adequate amount of water. Eating an excessive amount of salt can make your body retain water in the weirdest of places. This can lead to dark circles under the eyes. One of the most popular things that cause dark circles is allergies. Try to think of what allergens irritate you the most. 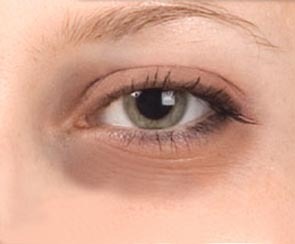 Dark circles can be due to sinus and nasal congestion also. Using a nasal cleaner and inhaling steam should take care in this case. One cause of dark circles under the eyes is vitamin deficiency mostly iron. You need enough iron in your diet to manufacture hemoglobin, which carries oxygen to the cells. If your iron levels fall too low, you might experience a variety of symptoms such as fatigue, frequent colds and bugs and dizziness, then you need to get your iron levels checked with a complete blood count, provided by your physician. Other causes can be alcohol, drug and medication interactions. Puffy eyes or dark circles can be early symptoms of other major disease. If they appear among other symptoms such as fever, skin rash, or difficulty breathing, consult your doctor right away.